Discussion in 'The Lounge' started by N8 v2.0, Oct 20, 2012. 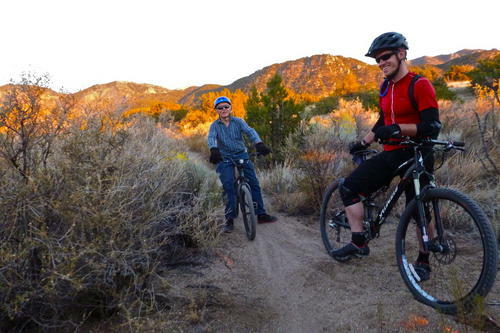 Neil is a 40-something dude I ran into on the ABQ trails one evening this week. We were at the top of a 4 mile 600' climb when he rode up on his ride. He was rockin' a BMX bike with a button up shirt, jeans, cotton work gloves and bottle of Starbucks go-juice in his front pocket. What really struck me was his smile of pure joy on his face as he came to a stop beside us to catch his breath. He said he loved every minute he spent on the trails, although he didn't get out as often as he'd like to. We chatted a bit and we took off only to come across him in the parking lot (he was parked next to me). 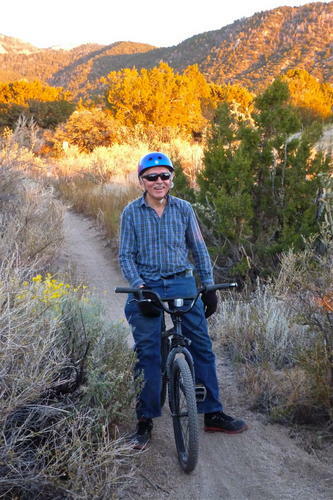 He'd pedaled that BMX bike 8 miles and up close to 900' and his face had the same joy on it that we'd seen earlier when we met him. Personally, I think the world needs more Neils. Is that a Floval Flyer? Sweet ride whatever it is though. neil is not a 40-something. dude looks a lot older than 40 something. Someone mark the calendar....first time in ever I agree with N8! Your friend needs to remove those reflectors from his wheels.